Kolkata Knight Riders (KKR) clinched their third win of IPL 2018, beating Rajasthan Royals by 7 wickets at Sawai Mansingh Stadium in Jaipur to reach the top of Vivo IPL points table. 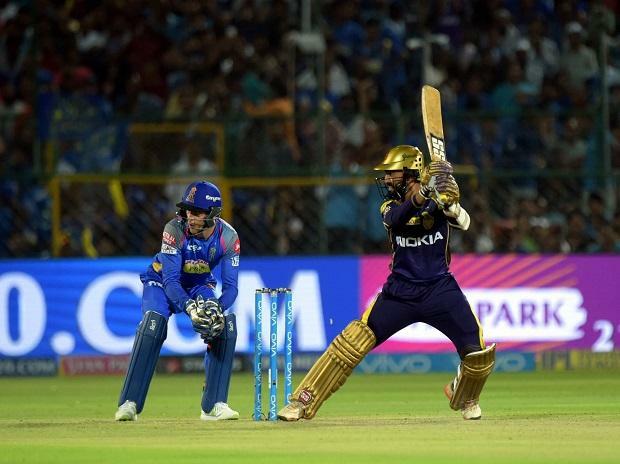 KKR captain Dinesh Karthik led from the front and scored a 23-ball 43. Robin Uthappa was good with the bat too as he scored 48 runs off 36 balls after Chris Lynn wicket in the first over. At no point, Rajasthan Royals’ bowlers seemed to create any pressure on KKR batting line-up. With this, Rajasthan Royals’ nine-match winning streak at Sawai Mansingh Stadium comes to an end. After a bad start, Sunil Narine and Uthappa stabilised the Kolkata Knight Riders’ innings. They both hit the ball well and rotated the strike regularly. Rajasthan Royals’ bowlers failed to take wickets at regular intervals and create pressure on the KKR batsmen. Poor fielding added to the woes of Rajasthan Royals. While batting first, Rajasthan Royals made 160-8 in 20 overs. The innings turned out to be a roller coaster. While runs were coming at a decent pace, wickets kept falling as well. Ajinkya Rahane made 36 from 18. D Arcy Shorts finally found some form and made 44. Sunil Narine was very expensive, in fact, today’s spell was his most expensive in IPL ever. He gave away 48 runs in 4 overs and went wicketless. Earlier, Rajasthan Royals were invited to bat first by Kolkata Knight Riders. RR had a rather stable start. Runs came at decent pace wickets kept falling hence the run rate never crossed 8 at any point. Rahane played well but could not carry his innings for long. He was dismissed for 36. D Arcy Shorts was dismissed for a well made 44. Over 1: Sunil Narine to open with Chris Lynn. Krishnappa Gowtham to start for Rajasthan. One run. Bowled him. Chirs Lynn tries to go across the line, misses. clean bowled. Robin Uthappa joins Narine. Keeping it very tight. KKR 1-1. Over 2: Dhawal Kulkarni is in. Miscommunication. Almost a run out. Four to Narine, over the keeper’s head. Single. Another single to Uthappa. KKR 9-1. Over 9: Narine is run out. Shreyas Gopal gets hit for six by Uthappa, he has found some form. Nitish Rana is the new man in.